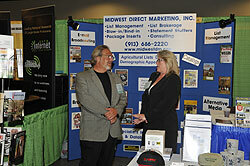 Thanks to all who attended the 2010 Agri-Marketing Conference, April 21-23, in Kansas City! This year’s conference attendance was the highest in 10 years! If you were at the conference and have not yet filled out the online survey, please do so at http://www.surveymonkey.com/s.aspx?sm=llIfMHX5o9XJcRdqbR_2bTYg_3d_3d. Your response is greatly appreciated! If you were unable to join us in Kansas City for the conference, take a look at the highlights on the NAMA blog at www.namablog.org. For a list of the Best of NAMA winners from the conference, please visit http://www.agrimarketingdigital.com for a complete list of winners. For photo highlights from the conference, please visit http://www.flickr.com/photos/namaflickr/collections/72157623950490478/. Special thanks to Denny Eilers, Iowa Photo Farm, for taking photo’s. 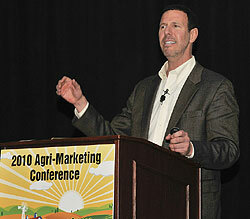 The National Agri-Marketing Association (NAMA) concluded a wildly successful conference on Friday, April 23, 2010. Boasting the highest attendance numbers in a decade, the mood at the conference was decidedly upbeat. Another important ingredient in the conference’s success was the stellar program packed with well-known speakers. David Meerman Scott got the conference underway with “The New Rules of Marketing and PR.” His witty and fast-paced presentation challenged conference goers to “think differently” and earn the attention of interested markets. Scott emphasized that posting videos, writing blogs and being active in social media channels is essentially free. He shared real world examples of how businesses are becoming shrewd users of these new tools to gain more awareness and better ROIs. 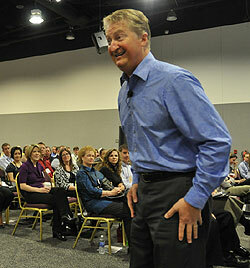 Attendees were regaled with the folksy energy and wisdom of Andy Andrews during the second general session. Andrews is a spellbinding storyteller and kept the crowd engaged with his stories, anecdotes and observations. He peppered his conversation with golden rule tips to help everyone in the audience, regardless of their profession, become more successful. This year’s conference also featured breakout sessions on social media, branding, trade show marketing, public relations and more. In addition, 2010 NAMA Agribusiness Leader of the Year, Dave Seehusen, and Marketer of the Year, Stephanie Liska, received their distinguished awards during the conference. Best of NAMA awards were distributed the evening before the conference began. 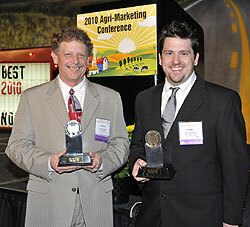 Best of Show Advertising went to Sullivan, Higdon Sink for their work for the Midwest Dairy Association. Best of Show Public Relations went to Dairy Management, Inc. and agency Weber Shandwick. NAMA conference planning committee members look forward to more well attended conferences in the future, as they plan to host in Kansas City for the next three years. consumers are demanding information and messages that are more relevant to them. Plus, channels continue to proliferate with Google, YouTube, Facebook, Twitter, texting, e-books and many other apps. So, how can marketers harness the power of these new rules of marketing and PR? David shared some ideas. David insists that marketers must unlearn what they have learned. First, buyer persona, not product features, is the key. Different buyers have a completely different point view of what they want and need. A tricycle, for example, could be sold in different ways to parents versus grandparents. Neither of which would be the actual user, a child who would see that tricycle in a completely different way. Secondly, marketers should earn attention by publishing information online. But not just any information. Publish something interesting and make it free. Then, encourage others to share that information or story by speaking to your buyers in their language and with real-life photos. David called this, “word of mouse.” Remember, though, that no one cares about your product or service except you. You cannot coerce people to share. Finally, don’t be afraid to lose control of your marketing and messaging. You can manage some risk of viral marketing by going where your prospects are – Facebook, Twitter, and chat rooms. You can create triggers such as videos and contests that encourage others to share. And, you should always point the world to your virtual doorstep. Many thanks to ABM Agri Council for sponsoring this informative and entertaining opening general session. 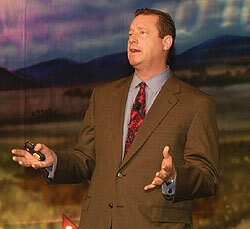 No one attending the second session would ever tell you that Andy Andrews lacked energy. He insisted that he was not a motivational speaker. Still, his personal stories were so engaging, his enthusiasm so remarkable, that everyone surely left the session knowing they had met someone special and were committed to following his advice. One of the things Andy has noticed over the years: everything is a matter of perspective. Perspective brings calm. Calm brings understanding. Understanding leads to creativity. Creativity opens the door to answers. Named by one New York Times writer as “a modern-day Will Rogers,” Andrews charmed the audience with stories and personal comments. He wrapped up by offering the two great ways to be great: 1) Smile while you talk; 2) Recognize people. By doing so, you will be that someone others will want to be around, to help, and to encourage. This remarkable and unforgettable session was sponsored by Syngenta. Paul Mobley started his presentation with a story explaining how he lost his love for photography, and how he regained it at a small-town coffee shop. There sat four farmers who would change the course of Paul’s life. Paul had never photographed anything having to do with agriculture before. But these people where so real, so engaging, that by the end of the summer, Paul had taken photos of nearly every farmer and farm family in that county. He pitched the idea of a book commemorating rural America. His publisher loved the idea, and off went Paul on a four-year, 100,000-mile journey through 37 states. Paul said, “This book is about people.” And so it is. Over 270 pages of incredible photographs of people who work the land. Incredible, too, are the stories behind those pictures. While Paul may have set up and posed his subjects, he says that his best shots came from those moments when people were unaware he was shooting. Still, it seemed that every photo captured the true character of people in agriculture. Paul’s book, American Farmer: The Heart of Our Country, contains more than two hundred portraits and forty-five farmer and rancher interviews. A journey through his book is truly a journey through the heartland. Our thanks go out to the Cattlemen’s Beef Board and Elanco Animal Health for their sponsorship of the Closing Session. 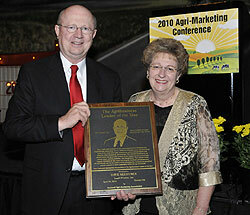 Dave Seehusen, Executive Vice President, Ag Business Development for Land O’Lakes, Inc., was honored with the 2010 Agribusiness Leader of the Year award, April 21, in Kansas City. The award, which is NAMA’s highest honor, honors outstanding leaders in agribusiness, education, government service or other agribusiness related areas who exemplify excellence in agribusiness by their significant contributions to the industry. 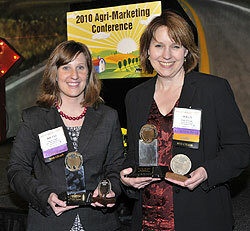 Stephanie Liska, CEO of Beck Ag, Inc., was honored with the NAMA Marketer of the Year award at the 2010 Agri-Marketing Conference, on Thursday, April 22. NAMA recognizes its active members with senior management of marketing and/or sales responsibilities with the NAMA Marketer of the Year award. This award is NAMA’s most prestigious honor awarded to active members of the association and honors outstanding accomplishments in the field of agri-marketing. Students from New Mexico State University took first place at the Student Marketing Competition sponsored by Monsanto. The competition was held April 20-22 in Kansas City, MO. The New Mexico State marketing team had 23 students involved with this year’s project to market Custom-made Saddles. The team spent the last several months doing market research, writing the marketing plan, and developing a presentation. The top six marketing teams this year were: First place, New Mexico State University; Second place, Illinois State University; Third place, Michigan State University; Fourth place, Iowa State University; Fifth place, Cal Poly-San Luis Obispo; Sixth place, University of Minnesota. Students decide on a project and develop a plan to successfully bring the product or service to the marketplace. In developing their marketing plan, students follow the same practices and principles used by today’s marketing professionals. Teams submit a written plan summary prior to the competition and then make a formal presentation of their marketing plan to a panel of judges at the competition. The judges’ panel consists of marketing and agribusiness professionals. 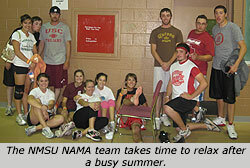 Overall, 31 student NAMA chapters participated in the marketing competition. 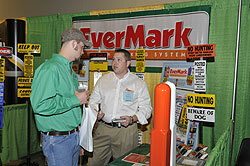 The competition is part of the annual Agri-Marketing Conference. Over 400 student members attended the conference. To view the Executive Summaries of the Final 6 schools visit http://www.nama.org/student/marketing.html. To view the Student Scholarship Recipients, visit http://www.nama.org/student/scholarship.html. 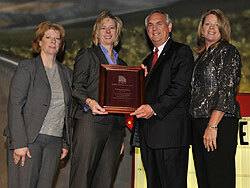 To view the Outstanding Student Chapter winners, visit http://www.nama.org/student/outstanding.html. The Southwest NAMA Chapter shares news from the recent NAMA Annual conference held in Kansas City, April 21-23. The Southwest Chapter hosted a reception for their Student NAMA groups from TX A&M, TX A&M Kingsville, Sam Houston State and New Mexico State Universities. The reception was held on Tuesday, April 20, and it was fun to share the enthusiasm and excitement the students brought to the evening – in preparation for their marketing presentations the next day! Congrats to the members of all these chapters for their hard work, enthusiasm and dedication. The Southwest NAMA Chapter is proud to be host Chapter of the winning team! Thanks to all the students for representing your schools and the Southwest chapter!